Someone is getting a gold star. I’m not sure who it is but I have tucked a shiny new star in my pocket along with a handful of confetti and a recording of “For He’s a Jolly Good Fellow” and when I find that wonderful person I am going to tag them with the star, baptize them with glitter and give them a round of applause, because they’ve made my bread-baking life into something glorious. What happened? Go ahead and ask because I would love to tell you. Go ahead. I read a book in which someone wrote that someone else said (the mystery person I am searching for) that you can reproduce the effects of crusty, hearty artisan loaves hitherto unattainable to myself by simply baking them in a covered Dutch Oven. Oh yes. Oh yes indeed. Thank you, lovely random man, because it works. It really, truly, honest-to-goodness works. I’ve done it twice now. 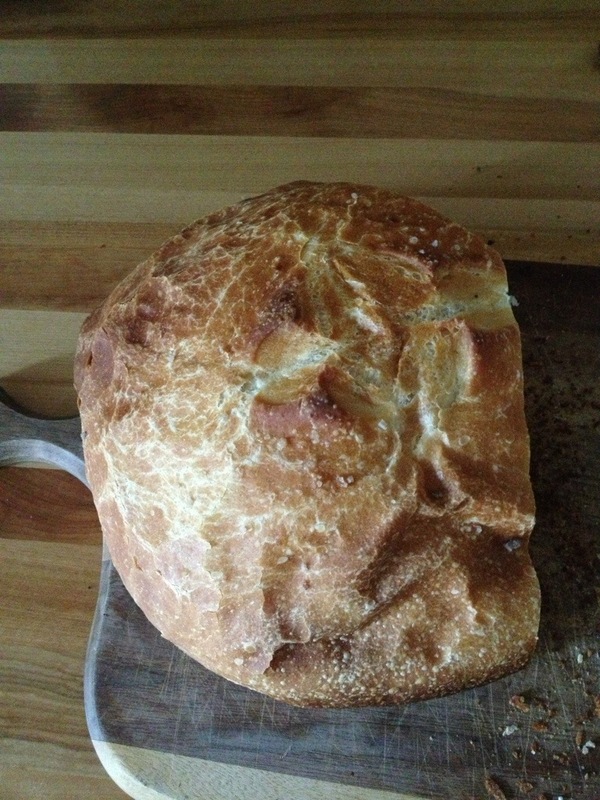 Baking a basic ‘lean’ bread dough (flour, salt, yeast and water) in an oiled Dutch oven creates a gorgeous loaf of bread fit for the snoodiest of artisan tables. My husband and I love a good rustic crust you can tear at and dip into stew without the threat of disintegration and I’ve finally achieved it. Seriously folks, this can only be topped by giving birth (which I am fully intending on doing in a few short months). The best part is that it’s so simple. So Simple. I made baguettes once and it was an elaborate process, absolutely worth it in the end but very time consuming and impractical for everyday eating. After hours of rising and kneading and rising and kneading, I baked the baguettes in a hot oven where an iron pan was sitting in the bottom. To this day I am not sure exactly *how* I managed it, but somehow I slipped the bread into the oven and poured a glass of water into the pan before shutting the door quickly and tightly. The hot pan immediately created the steam bath needed as the final step in making a truly chewy crust. Success, but at a price. Oh, how differently this works! After the first rising, the dough is kneaded down and then placed in the oiled dutch oven to rise again. Then, when the dough is doubled and the oven is heated to the right temperature, the loaf is brushed with olive oil, sprinkled with coarse salt and the cover is placed on top. This bakes for 20 minutes and the bread makes its own steam – how clever is that?!? Once the crust is firmed, the cover is removed and the bread finishes baking, browning and bubbling and making itself perfect. Perfect, I say. We can hardly wait to eat it – and often don’t. Is there anything better than fresh, hot bread drowning in butter? Or – perhaps fresh hot bread dipped in garlicky olive oil and balsamic vinegar? I didn’t think so.